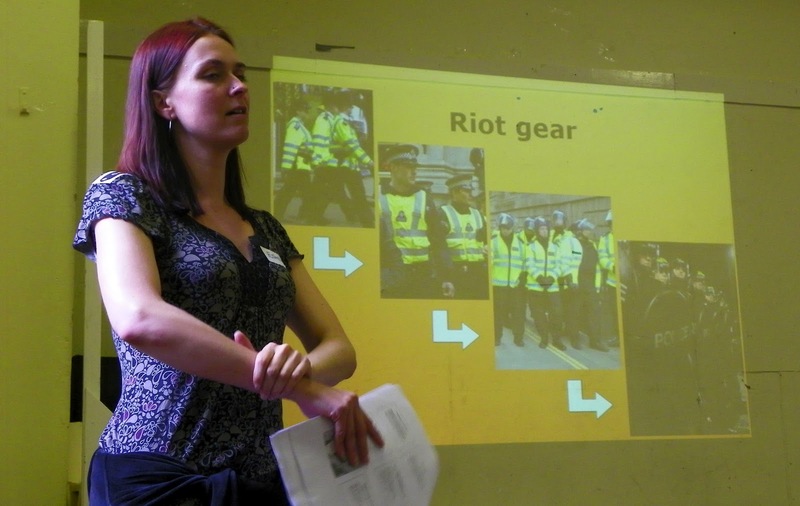 Over forty people came for yesterday's training run by Newham Monitoring Project for people prepared to become Community Legal Observers during this summer's Olympic Games, with more than 30 more signed up for a second session at the end of this week. With the eyes of the world on east London during the Olympics, the role of these volunteers will be to monitor the huge policing and security operation that involves up to 12000 officers on peak days from forces from all over the country and ensure that the civil liberties of local people are not pushed aside in the pursuit of a 'perfect' Games. Community Legal Observers will take to the streets in teams in four daily shifts throughout the Olympic period, supported by a back office of experienced staff to respond to incidents and provide advice. As well as giving out information, letting people know about NMP's 24-hour emergency number and talking to local people about their rights, volunteers will record what they see. Their role is to gather evidence rather than to intervene, which means that specialist legal experience is unnecessary, just basic common sense. However, the hope is that the very presence of legal observers will have a positive impact on reducing disproportionate and excessive policing in east London during the Games. NMP's training focuses on the issues that are most likely to impact on local residents, especially young people: the use of stop and search powers, the dispersal zone in Stratford, curfew powers and what to record when witnessing an arrest. By the end of the Olympics, NMP aims to gather together the evidence from its volunteers to produce a detailed report on the way the Games have been policed. It isn't too late to volunteer - the next training is on Friday 15th June from 11am to 4pm at the Harold Road Centre in Upton Park. If you'd like to become a Community Legal Observer, contact NMP to register. Further training is planned for July if there is sufficient demand and hopefully there will be 100 trained observers by the Olympics opening ceremony on 27 July. If you're visiting Stratford this summer, don't forget to look out for volunteers in their distinctive red vests. And just in case the policing operation is as heavy-handed as everyone expects, stick this free telephone helpline number - 0800 169 3111 - in your phone. You never know when you may need it. Original articles on Random Blowe are licensed under a Creative Commons Attribution-Noncommercial-Share Alike 2.0 UK: England & Wales License. Comments on Random Blowe are now more lightly moderated than before but those that I consider to be downright abusive, wildly off-topic, misogynist, racist or homophobic will be deleted. Random Blowe | Original articles licensed under a Creative Commons License.